I have a ritual every time I fly through Sea-Tac Airport (which sadly, is far too frequently). 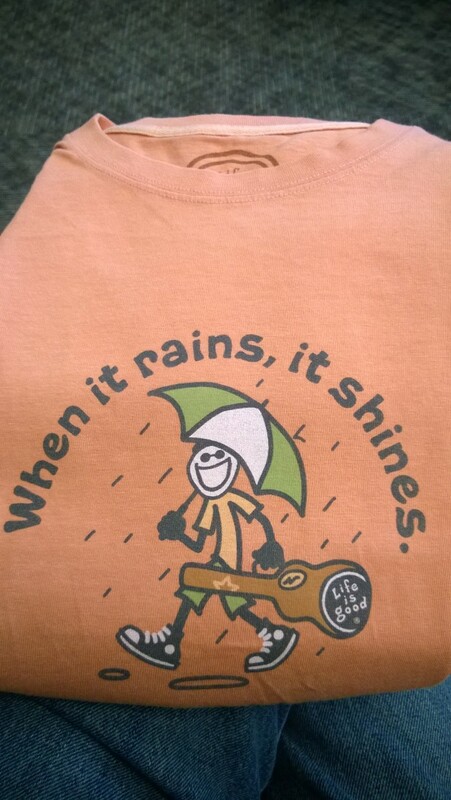 Right after I get through security, I walk through the Life is Good store on Concourse C. I’ve been on the hunt for the perfect t-shirt: one that represents the more carefree aspects of my life these days. And ideally, one with a guitar. The store rotates through different designs on a fairly regular basis, but so far I’ve been unable to find the Right T-Shirt. This one is so good, I swear they must have stalked me. It’s me, all the way down to the Chucks. And I like that the guy is wearing an orange t-shirt — that’s thinking ahead. It is mine now. I wonder how long it will take me to wear it out. I found this right after I discovered that my flight is delayed over an hour. Message received.